Md. Senate Passes Bill Requiring Presidential Candidates To Release Tax Returns : The Two-Way The bill follows President Trump's refusal to release his tax returns. Governors elsewhere have vetoed similar legislation, citing concerns about constitutionality. 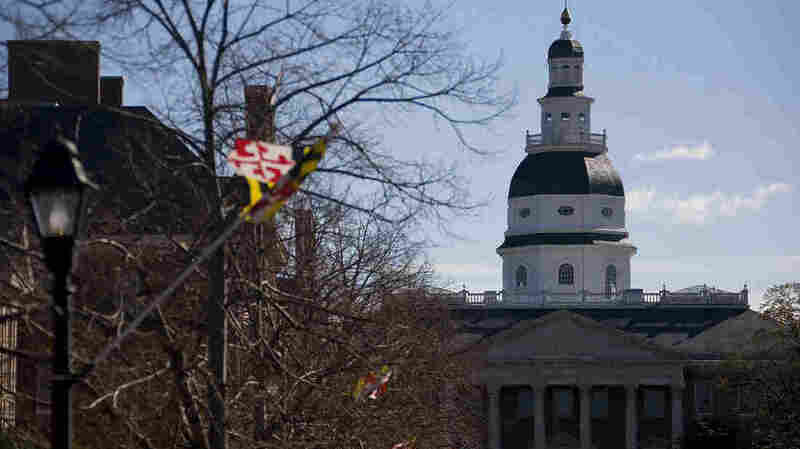 The Maryland Senate approved a bill on Monday that would require candidates on a presidential ticket to release their tax returns in order to get on the state's ballot. If passed, this would be the first such law in the U.S., and would require tax returns going back five years. The bill follows President Trump's refusal to release his tax returns. "We think people should have that information," said state Sen. Paul Pinsky, one of the Democrats sponsoring the bill, The Associated Press reports. "We should know if a president could potentially be compromised or manipulated." But not everyone was happy about the proposal. "This is the most childish bill that I've ever seen and I'm embarrassed that it's on the floor," Minority Whip Stephen Hershey said, The Baltimore Sun reports. Sen. James Brochin is one of the four Democrats who opposed the bill. "Show me in the Constitution where it says that's a qualification for being president of the United States," Brochin told the Sun. "We can't go along and make up rules when we don't like the president of the United States." Even those who voted for it aren't sure it passes constitutional muster. Last year a counsel for the General Assembly concluded that the bill "is not clearly unconstitutional." "She equivocated, OK?" Sen. Pinsky said, the Sun reports. "This has not been tested in the courts." Governors elsewhere have vetoed similar legislation. California Gov. Jerry Brown was one, expressing concern that such a measure set a "slippery slope" precedent and might not be constitutional. Then-New Jersey Gov. Chris Christie was another, calling his state's bill unconstitutional and a "transparent political stunt." Some have compared such efforts to the "birther bill" that Arizona legislators passed in 2011 that would have required candidates for president and other offices to prove they were born in the United States. Then-Gov. Jan Brewer vetoed the bill, saying it gave the secretary of state too much power. Maryland's bill now goes to the House of Delegates, which is controlled by Democrats. Gov. Larry Hogan, a Republican, has not taken a position on the matter. Republican Sen. Stephen Waugh said the bill would not survive a legal challenge. "There is only one way this bill is going to end and it will end in a humiliating defeat after we spend millions of dollars losing our way to the Supreme Court," Waugh said, according to the AP.